From the very early stages, I was convinced the Cambridge programme aligned with what I was looking for in an MBA: from globally diverse classmates to brilliant lecturers, all integrated within one of the world’s best universities—the list goes on. Having previously worked for the finance industry in analytical roles based in Bangalore and Gurgaon, I felt the need to expand my horizons by learning the science, and arts, of business management as well as gaining a deeper understanding in areas of finance. Once I received my MBA offer, I applied and was awarded the BNY Mellon-sponsored scholarship for finance candidates towards my study. Apart from the generous financial aid, the scholarship also opened doors for me to interact with BNY Mellon. I have already been talking to my sponsors about a prospective project over the summer term. Over the past five months, I have gained profound insights into different areas of business via the core courses which have included Organisational Behaviour, Strategy, and Operations. I have subsequently chosen Finance as my MBA ‘Concentration’- a package of advanced sector-specific courses and coaching unique to the Cambridge MBA programme. The course structure has really allowed me to develop a macro-perspective of management and business, alongside a deeper delve into the Finance area. The Cambridge MBA offers a wonderful balance of academic lectures, corporate-led sessions and project work allowing us to not only to learn various business topics, but to simultaneously practice them in real life situations. During the year we have two major team projects – the Cambridge Venture Project (CVP) in the first term and the Global Consulting Project (GCP) in the Easter break. For the GCP, my team and I will work in London with one of the biggest global banks on a really exciting foreign exchange project – I can’t wait to get started! On reflection the MBA has given me the opportunity to work on projects and in knowledge-spaces that I would otherwise never have had access to. I truly look forward to taking all that I have learned this year at Cambridge back into my industry. 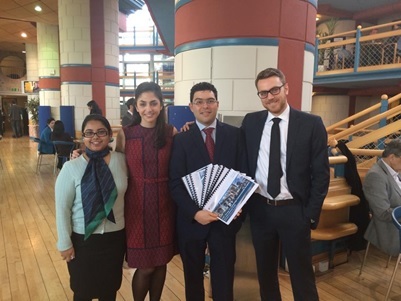 Find out more about the Cambridge MBA. Find out more about the BNY Mellon Scholarship.